Chewy Peachy Keen Oatmeal Dog Cookie Recipe - The classic oatmeal cookie recipe is transformed into a sweet treat for your dog. The addition of peaches and molasses provide enough sweetness to satisfy most dogs sweet tooth cravings. 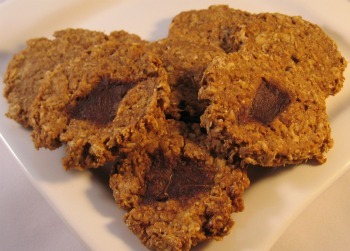 There are several variations you can make for this dog cookie recipe. Although fresh peaches are a healthy treat for your dog, you can also use canned and frozen peaches. Be sure to check out our tips for using all three types in your homemade dog treats. A fun way to decorate this dog cookie recipe is to slice a small piece of peach and embed it in the cookie before you bake. When the finished treat is ready to serve, your dog will have a nice texture difference in the cookie as the middle will still be slightly soft and sweet. Do you like the idea of providing unique and healthy dog treats for not only your dog, but all dogs? 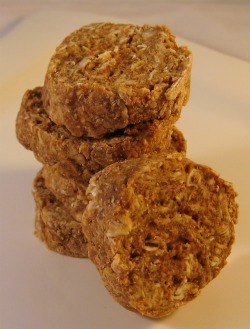 Maybe you can see the potential for fruit and vegetable based dog treats on the dog treat market. Then you may want to consider starting a dog treat business. To help you get started, read my review of the book about how to start your own dog bakery business. There are several toys in the Busy Buddy line of toys. This month we're focusing on the Kibble Nibble toy. Below is a very helpful video reviewing the toy and showing a dog playing with it, too. The toy is dishwasher safe, so it can be kept clean for daily use. Your dog may like it so much that all of her daily food can be served in the toy. You can use your dogs regular dry kibble in this Busy Buddy toy, or bake a healthy dog treat extra hard to use in this fun and entertaining toy. "When I found your site, it helped me find a way to make treats for our Shih Tzu mix who was itching all the time. I am so thankful for this website." "I LOVE the newsletters from you! The recipes are always amazing and delish. My canine adores the recipes and she woofs you very much for the newsletters chalk full of cool ideas. Thank you!" This months tip is for the Peach & Oatmeal dog cookie recipe above. If you are short on time, you'll love this quick tip. Instead of scooping out individual cookies, turn the dog treat dough into traditional ice box cookies. What are ice box cookies, you ask? They are not a single type or flavor of cookie, it's more of a method. The ice box cookie method is a quick and easy way of turning cookie dough into a slice-able log for easy baking. For the Peach & Oatmeal cookies you will want to follow all the steps through step #8. Then lay out a large sheet of wax paper. Dump the dough onto the paper. Start to roll and shape a log approximately 1 to 1 1/2 inches in diameter. Once you have an even log, twist the ends of the wax paper like a piece of candy. Store the log in your freezer in a labeled gallon size freezer bag for up to 2 months. If you want to bake the same day, leave the log in the freezer for a minimum of an hour. If you want to bake several days later, remove the log and let it come to room temperature while you preheat your oven. When your oven is ready, slice 1/2 inch thick slices of cookies and lay on a prepared baking sheet. Bake as long as the recipe instructs. A fun tip from Martha Stewart is to store your dough, once in a log shape, in an empty paper towel tube to keep it's shape while it freezes. Once you know your dog loves a particular dog treat recipe, you can bake a double or triple batch and freeze in logs for ice box cookies any time your dog gets a desire for homemade dog cookies. Summer is in full swing, skip the oven and make these quick and microwavable homemade dog treats next month.